This statistic represents the market share of leading countries in machine tool production in 2017. That year, Germany accounted for some 16.5 percent of the world's machine tool production and was ranked second. In 2017, China topped the ranking of the largest machine tool producing countries worldwide. With machine tool shipments to the value of about 17.9 billion euros, China reached a staggering market share of nearly 25 percent. 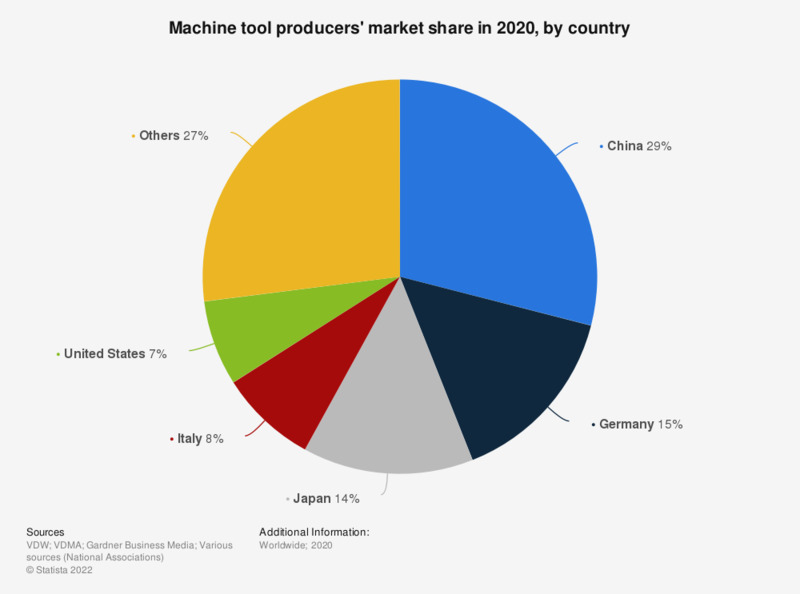 China, Germany and Japan were the three leading machine tool manufacturers globally, while the United States (5.2 billion euros) and Italy (about 5.5 billion euros) accounted for a bit more than seven percent of global machine tool production each. The world’s biggest machine tool manufacturing companies include China’s Shenyang, Germany’s Trumpf, Germany-based DMG Mori Seiki and South Korea’s Hyundai. Overall, Asian countries accounted for just under 50 percent of global machine tool production. The leading Asian machine tool producing countries include China, Japan, South Korea, Taiwan and India. Everything On "European machine tool market" in One Document: Edited and Divided into Handy Chapters. Including Detailed References.